This week Xur is selling his wares as usual but with a difference for Hunters, now you can purchase one of the best Helmets for the Crucible. 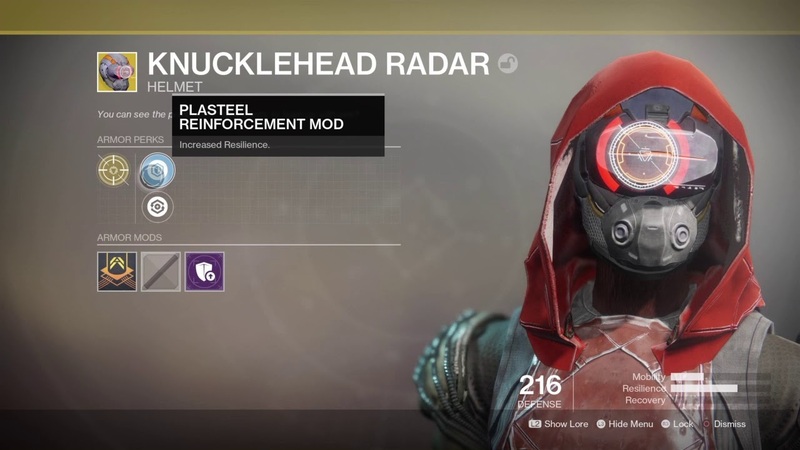 The Knucklehead Radar is almost a crutch for many PVP specialist Hunters because of it’s Exotic Intrinsic Perk, which we’ll get onto in a bit. The Helmet is easily recognisable and will completely change the way you fight other Guardians across the Crucible, and with Destiny 2 Season 2 fast approaching you’ll definitely want this in your armoury for the next Iron Banner event. Let’s start with what this Helmet is all about. The Exotic Intrinsic Perk is called Upgraded Sensor Pack, which provides radar while aiming. Yes you just read that, this Helmet fundamentally changes a mechanic in the game that is meant to provide balance to the Crucible and those who prefer to play PVP over PVE. I cannot stress enough how useful it is being able to maintain that radar while aiming in PVP, simply because no enemy will be able to sneak up on you while you’re firing on their team. The Mods on the weapon are Plasteel Reinforcement Mod, which increases Resilience and therefore the amount of damage that you can take, and Restorative Mod, which increases your health recovery. Of course you have to switch between these mods and that can be challenging to decide. Personally I go for the increased Resilience because I’m the kind of Hunter who dives into the enemy and does all kinds of damage with whatever’s going, mostly my fists. The Helmet also comes with the optional Impact Absorption Mod. This further increases Resilience and can actually boost it even further so that you’re almost a tank that can take a decent beating but ultimately come out on top in a close quarters firefight. The Knucklehead Radar will set you back 23 Legendary Shards but it’s totally worth it. If you’re a PC player at the moment then you’ll be looking for the best armour you can to up that Power Level, and I can’t recommend this Helmet enough. Even if you have to dismantle some Legendary gear or weapons that you wanted to infuse later on I’d just go ahead and dismantle them so you have this now. If you do you’ll be on the path to better gear faster, and it’ll drop at a higher Power Level. Let us know what you think of the Helmet in the comments.